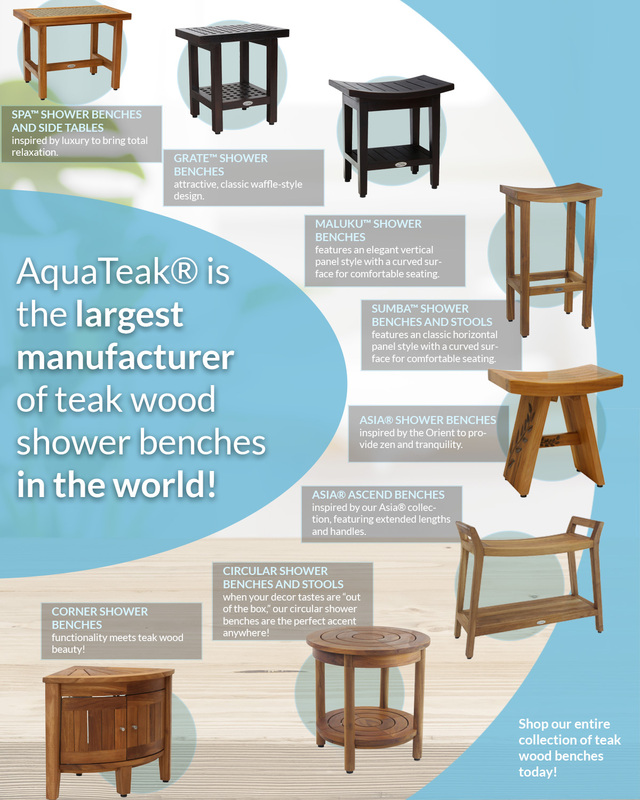 AquaTeak® is the largest manufacturer of teak shower benches in the world! With over 100 quality, hand-crafted teak wood bath and spa products to choose from, we are confident that we have the perfect teak bench to meet your needs! We also offer a wide variety of additional luxury items to outfit your entire home, patio, spa, and pool. Teak wood furniture is naturally water-proof and weather-resistant that make it incredibly durable and low-maintenance. All of our products come with a 100% satisfaction guarantee,a 5-year manufacture guarantee, and free shipping options. Browse our entire selection of teak wood shower benches today! The Spa shower bench and side table collection was inspired by luxury to bring a sense of total relaxation to wherever it is placed. Made of environmentally-friendly Indonesian teak wood, and accented with stainless steel hardware and non-slip rubber feet, these benches are durable, functional, and beautiful. The Grate collection features our waffle-style design that is known as the classic spa look. These grate benches are made of solid, all-natural teak wood that makes it ideal for use in wet environments such as patios, spas, showers, and poolside. These benches are available in a variety of sizes and are available with or without shelf options. The Maluku shower bench and stool collection feature a vertical panel style that adds a touch of quiet beauty to any space they occupy. The space-saving design of these benches makes them the perfect accent for your spa-like bath, home bar, or outside on the patio. These shower benches are made with all-natural teak wood and accented with stainless steel and non-slip rubber feet. The Sumba collection of teak wood shower benches and stools feature a horizontal panel, curved top for the ultimate in comfortable seating. This collection offers a variety of color and style options including various height and surface sizes, as well as shelves. Whether you use these benches on your patio, poolside, or in your spa-like bath, you are sure to feel the tranquility they provide. The Asia shower bench collection is designed with the simple aesthetics of the Orient. The angled legs and clean lines help bring zen and tranquility to any space. Handcrafted from natural Indonesian teak wood, these shower benches can be used anywhere you need functional beauty. The Asia Ascend collection of benches expands on the original Asia collection. With longer lengths and handles, they are perfect for providing additional seating in wet environments such as a spa, pool deck, or patio. These benches are available in various heights and with or without shelves. Our round shower benches and stools are perfect for fitting in with a design motif that is outside the box! The teak wood round shower benches feature a variety of options including shelves and stainless steel accents. Use as a bench, stool, or side table indoors or outside! For smaller spaces, AquaTeak is proud to offer corner shower benches and stools that fit snugly into any corner. Made of all-natural teak wood, these corner benches are long-lasting and beautiful. These benches come in a variety of natural wood colors and offer a variety of options including shelves and front-facing doors.